Enel's core earnings were up 3.8 percent last year. The Italian energy giant Enel has seen a growing clean energy focus pay off with a 3.8 percent increase in core earnings in 2018. The rise, which saw earnings before interest, tax, depreciation and amortization (EBITDA) hitting €16.2 billion ($18.3 billion), was mainly a result of improving margins on the company’s renewable projects in Italy, Spain and Latin America, Reuters reported this month. Net debt was also up 9.9 percent, to €41.1 billion ($46.4 billion). The results, in line with company targets, saw Enel’s share price dipping slightly in the days after the announcement, although the stock continues to trade well above its five-year average. The earnings growth also validated a strategic plan that Enel laid out last November, when it forecast €1 billion ($1.1 billion) of incremental EBITDA from renewables between 2018 and 2021. Renewable energy technologies such as solar were delivering up to 20 percent extra margin compared to thermal generation, the company said. The profitability of the business led Enel to claim to be the world’s largest renewables player by installed capacity, with 43 gigawatts under management. “Renewables have been the group’s engine for industrial growth, as fully reflected in Enel’s generation mix, which at the end of 2018 will be around 50 percent composed by emission-free technologies with a positive impact on [carbon dioxide] emissions reduction,” said Enel in a press release. The company will spend a further €10.6 billion ($12 billion) on renewables between 2019 and 2021, Enel said. It is focusing on Italy, Spain, Chile and Brazil and aims to increase the level of emissions-free generation to 62 percent by 2021. Most of this will come from increases in solar and wind generation capacity. Enel’s global wind portfolio is set to expand from 8 gigawatts in 2018 to 14 gigawatts in 2021. Over the same period, the company will increase solar generation from 2 gigawatts to 5 gigawatts. Overall, Enel is planning to increase renewable generation capacity by 25 percent. Its thermal capacity, which includes 15 gigawatts of combined-cycle gas generation and 3.3 gigawatts of nuclear, is set to fall by 15 percent, mainly through the retirement of coal plants. 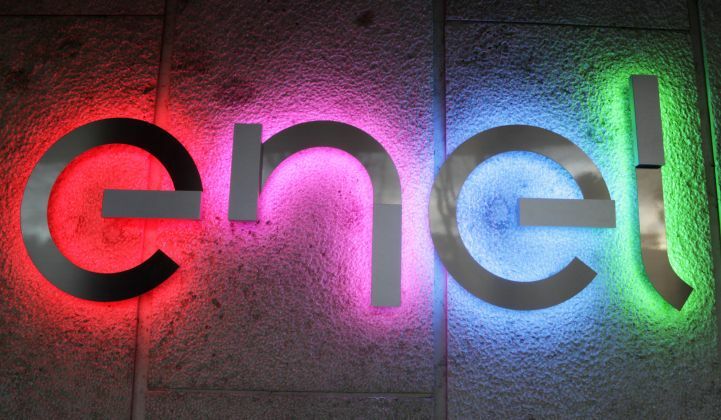 The utility also said it would be investing €1.1 billion ($1.2 billion) into Enel X, an e-solutions subsidiary that includes corporate acquisitions such as Demand Energy and EnerNOC and is focused on areas ranging from sustainable mobility to fiber optics for smart cities. Bloomberg this month named Enel as one of several European utilities expected to outperform the stock market in spite of high valuations. Along with French players such as Engie and Veolia, Enel and fellow Italian utility A2A “offer significant potential on improved market conditions and recent investments that are starting to pay off,” Bloomberg said. Tom Heggarty, senior solar analyst at Wood Mackenzie Power & Renewables, told GTM that one of the reasons for Enel’s success with renewables was the build, sell, operate (BSO) model adopted by its developer arm Enel Green Power (EGP). “After developing and de-risking wind and solar projects, EGP will then farm down its stake in those assets, typically by selling significant shares to institutional investors with very low cost of capital,” Heggarty said. “These investors are looking for low-risk, long-term investments, which operational renewable energy projects are well positioned to offer," he added. In 2018 alone, Enel had sold 80 percent of the capital of eight solar projects in Mexico, Heggarty noted. “The BSO model is a key pillar of EGP's strategy over the next two to three years, and we'd expect to see further divestment of projects over the course of 2019,” he said. Flipping assets in this way is a well-established strategy in the renewable energy sector, Heggarty said. It allows developers to achieve higher returns compared to owning and operating projects indefinitely. It also allows capital to be recycled into new project development activities, Heggarty said, but usually means developers lose the long-term, stable cash flows that come with owning assets for their lifetimes. “What's slightly different about EGP's approach, though not unique, is to maintain the rights to operate the projects, therefore offering an additional revenue stream,” Heggarty said.